We think we’ve got just the thing. 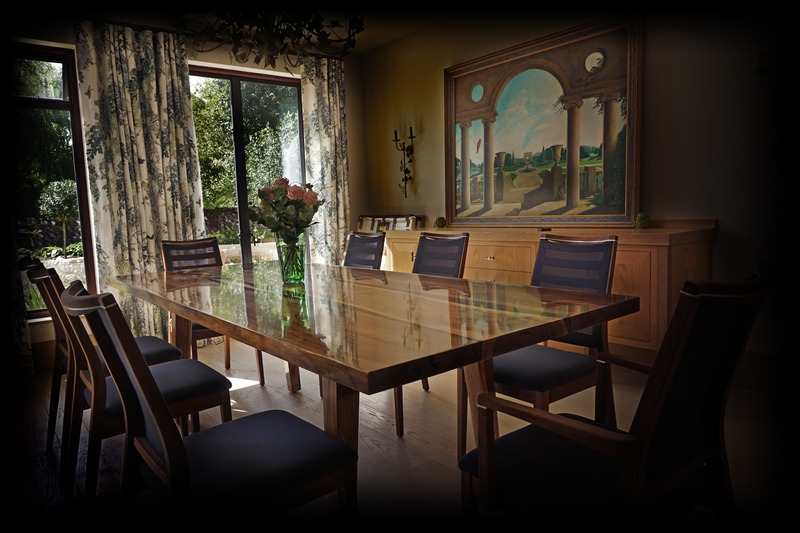 If you have a family, love to entertain, or simply wish to enjoy quality time with your partner, talk to Earthy Timber about a bespoke, earthy luxury wood dining table. These are natural yet artistic dining and kitchen tables of the highest quality and craftsmanship. 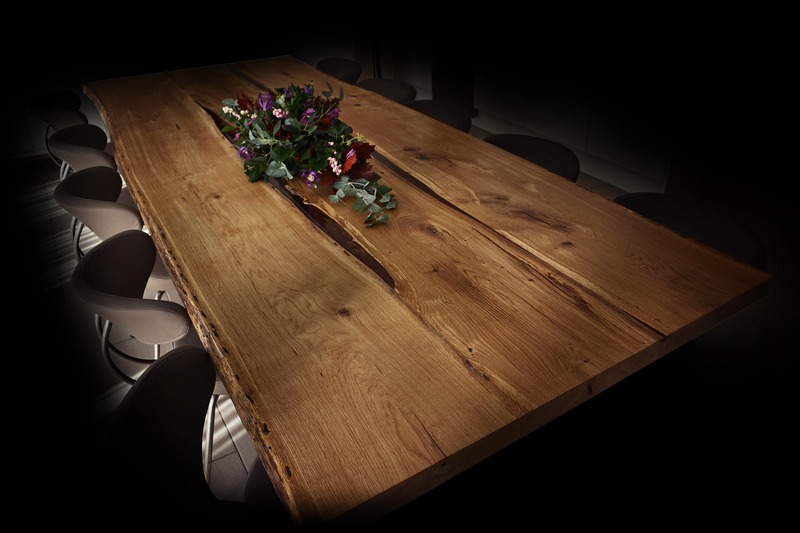 We source, design, create and finish a wide variety of species and sizes of locally sourced from National Trusts, Forestry Commission, private estates and community trusts wooden slabs and turn them into luxury dining tables. Working with a wide range of sustainable English timbers such as but not limited to Oak, Brown Oak, Wild Walnut, Hornbeam, Pippy Oak, Sycamore, Chestnut, Yew Tree we produce wide plank tables for your dining room or kitchen up to six metres long (without any joints) and as wide as you wish. 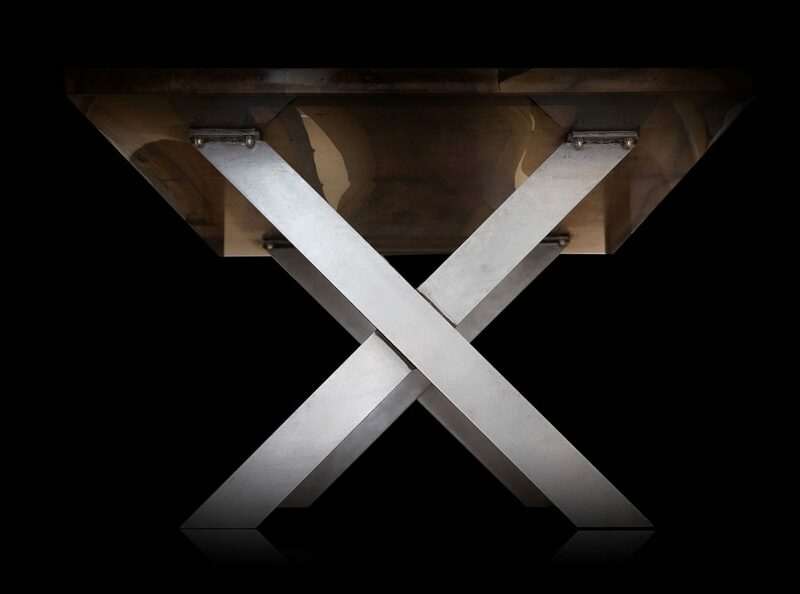 Your dining table can be created in a variety of thicknesses and with a stunning array of finishes. A piece of furniture so beautiful that you, your family and friends won’t be able to resist touching it. Creative, beautiful yet fully functional, a work of art to enjoy, use and admire every day. Natural Wood at Its Best. Enhanced by Timber Specialists. 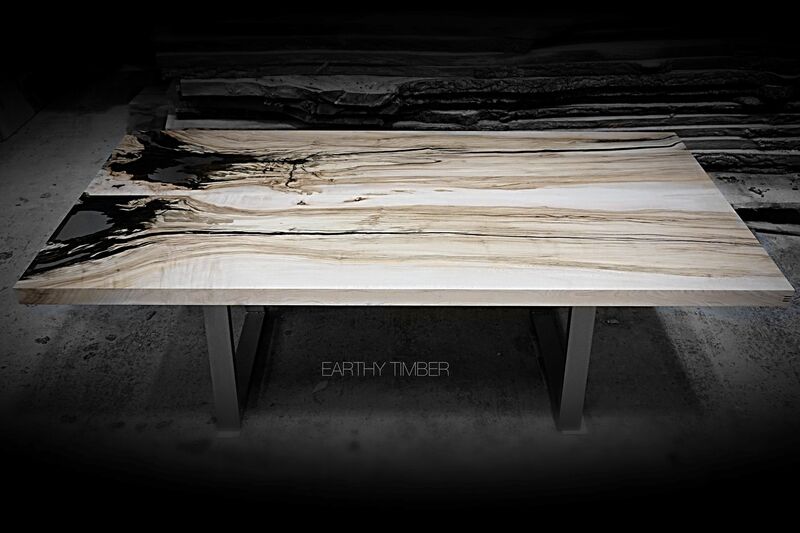 Here at Earthy Timber, there’s one rule: we allow the pieces we source to reveal their secrets to us. We can select the pieces that we know will work best for you, making subtle enhancements to the wood once its true natural beauty has started to appear; we will work on bark preservation, perhaps enhancing knots or voids for example. The scars, whorls and natural patterns of wood are part of the character of the tree, so each piece is treated individually. If you appreciate a real “wow” factor, talk to us about natural, otherwise called live edges (sometimes called raw edge table, natural edge table, waney edge table, wavy edge table, earthy edge table). We have the skills and technology to preserve and enhance what would otherwise be removed – the sensual, undulating flow of the edge of a wooden slab. You will not believe just how stunning this really is until you see it. Earthy Timber can mix the rough with the smooth – or rather, its captivating appearance. 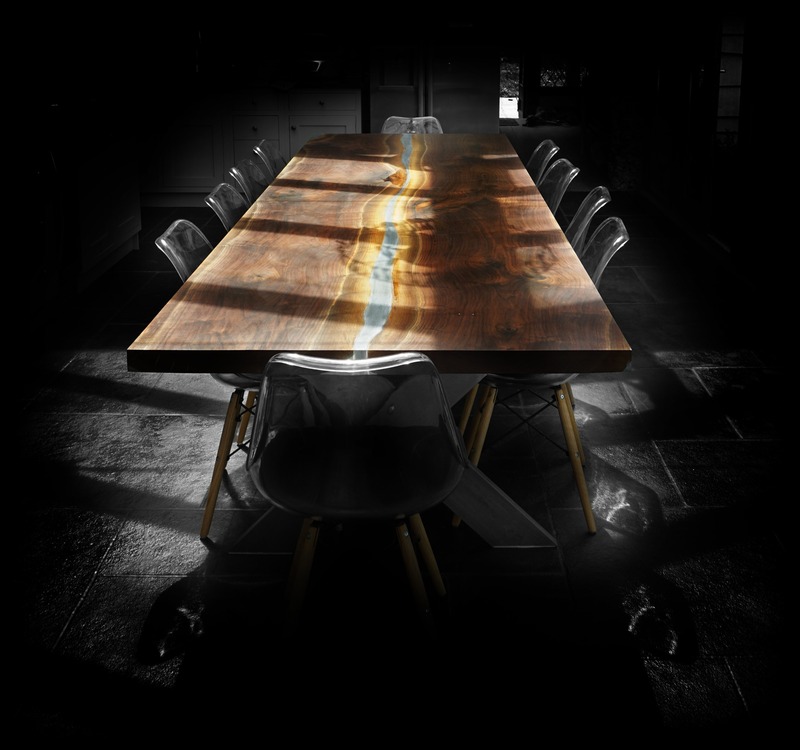 Ask us about our specialist tree bark table preservation and live edge squared table techniques that showcase the contrast of the warm colour of wood beautifully framed by the dark hues of the bark that encases it. This is wood as you’ve never seen it before. Our wood resin infill techniques are truly unique and artisan: this is not mass manufacture. Each table project is treated individually, with a variety of techniques and processes letting the waney edge wood do the talking. We have put together a comprehensive guide to our specialist wood enhancement techniques, which you can read about here. We produce unique wood tables & matching benches from the same tree planks, ensuring the wood grain and features are harmonious. Our luxury wooden furniture are both practical and fully functional. In house vacuum kiln drying plant, metal workshop , extensive knowledge in technical properties of wood resins and metals allow us to produce superb quality, refined yet natural looking wooden furniture. The natural beauty of your natural edge dining table (square, squared with resins or bark preservation if you prefer) will stand out, supported by strong, elegant handcrafted table legs that enrich the final piece. You may wish to complement your work of art dining table or kitchen table with Earthy Timber’s bespoke wooden benches , breakfast bar or kitchen island. Earthy Timber’s Vacuum Kiln-Drying Chamber . On Site at our Premises. We operate a vacuum kiln on-site at our workshop as part of our all-in-one service offering. As a natural substance, untreated wood (or wood that is not dried properly) can shrink rapidly and can warp or bend. Distinct from conventional drying processes, vacuum kiln-drying removes the moisture evenly, penetrating the waney edge timber slab thoroughly (especially important when you work with chunky wood slabs) to desired moisture level below 10%. The result is a high quality, robust and long-lasting wood slab that we can start to work our magic on. 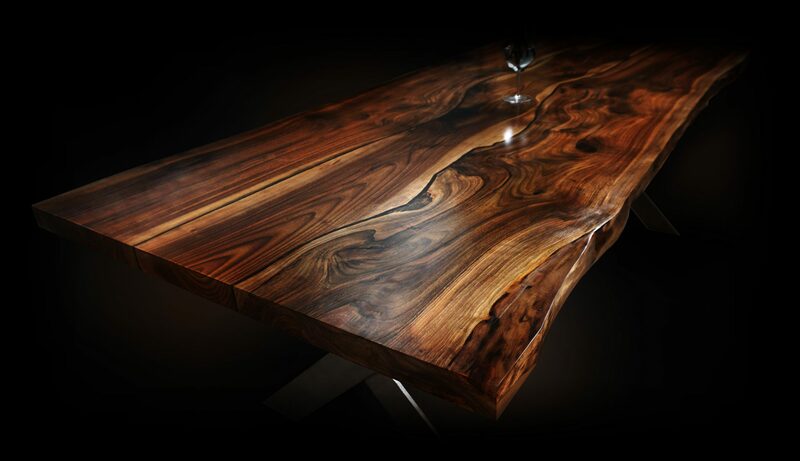 This technique ensures stability, an essential part of what we can offer you: strong, unchanging wood that, once fashioned into your luxury dining table and treated with our specialist resin and or metal finishes, will last for generations. For you, our customer, this means that the journey from tree to your dinner table is carefully managed to the highest level of craftsmanship. Keen to discuss your project for a dining table for your home? We see our customers by pre-arranged appointment only. Please use our contact form to send us the details of your project. We are looking forward to hearing from you.